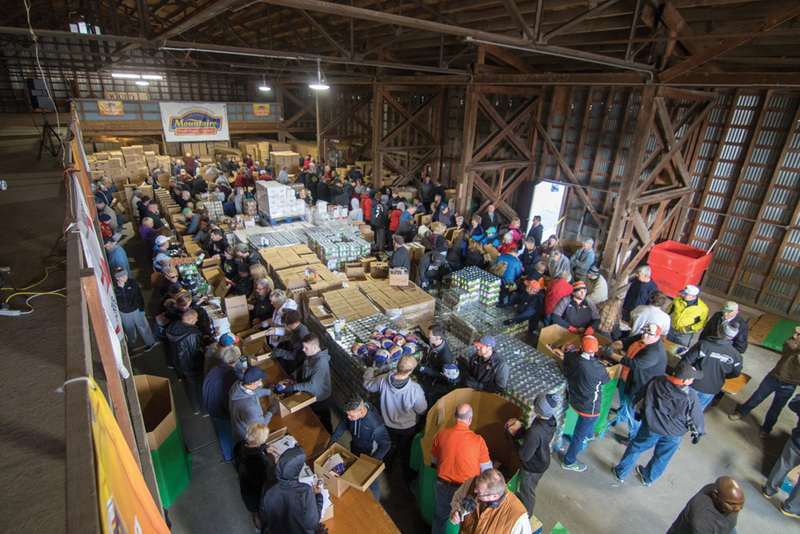 Hundreds of people gathered at Mountaire’s Selbyville warehouse on Monday, Nov. 19, to pack 8,500 boxes of Thanksgiving meals for people in the community. Mountaire began its Thanksgiving for Thousands event 24 years ago, with the idea of providing Thanksgiving meals to those in the community who would not otherwise be able to have the holiday meal. Over that time, the packing event has grown, and now the business also provides meals at other holidays — Thanksgiving at Christmas and Thanksgiving at Easter. In the 24 years, the packing events have fed 1 million people on Delmarva. 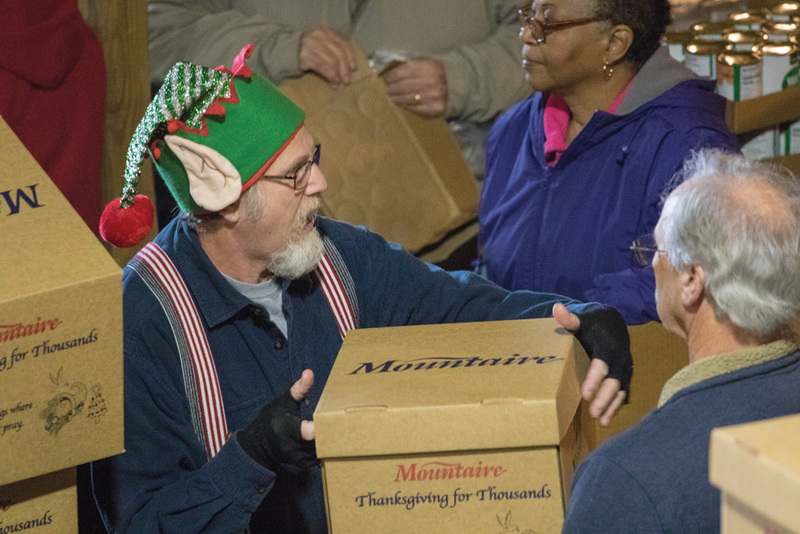 Every Monday before Thanksgiving, Mountaire invites community members to its Selbyville warehouse to pack boxes of food to be distributed throughout the peninsula to families in need. Each box includes a Mountaire roaster, as well as corn, string beans, yams, cranberry sauce, stuffing mix and a brownie mix for dessert. This Monday, 8,500 boxes were packed. The packing event brings out people from across Delmarva. And those who volunteer one year often keep returning. “It’s a really good feeling when you’re finished, because you’re doing something for people who aren’t as fortunate as we are. At least they can have a good Thanksgiving,” said Tom Maly, treasurer of the Fraternal Order of Police Lodge 16 out of Bethany Beach. Maly was joined by about 10 other lodge members, and noted that they volunteer to pack boxes at Christmas and Easter, too. Maly encouraged those who don’t already volunteer to check out the packing events just once. Ray Myers, president of FOP Lodge 16, said many of the group’s members have dedicated their lives to service, so it only makes sense that they would continue to do so in retirement. Packing is even a family-affair, as Myers’ wife has joined him at previous events. While gawking at the sheer number of boxes, Myers noted it still doesn’t cover all those in need. He noted that, five years ago, his family was introduced at church to three people from the country of Moldova. At every packing event, Mountaire hands out employment applications to those interested. Marino said numerous employees have been hired because of that outreach. Sussex Academy student Brady Cunnane, 12, was helping pack for the first time on Monday. 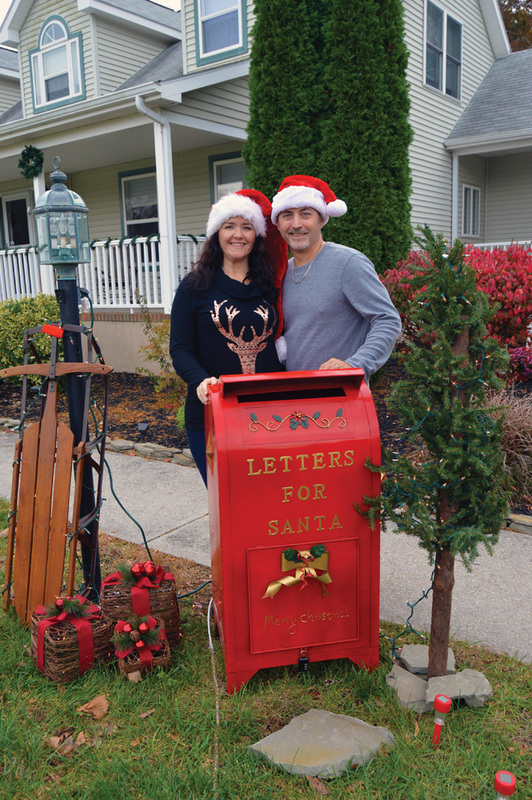 Cunnane said that, while it was his first time at Thanksgiving for Thousands, he had previously volunteered at his church to pack boxes of toys for kids at Christmas. Lord Baltimore Lions Club member Paul Bolton, who is also a member of the American Legion and FOP Lodge 16, has been packing at the event for four years. He noted how excited he was to see so many students volunteering. The number of volunteers, said Bolton, speaks volumes about the packing event. For more information about Mountaire Farms’ Thanksgiving for Thousands or other packing events, contact Roger Marino at (302) 934-3123 or email RMarino@Mountaire.com.